One of the things I used to promote was eating 5-6 small meals a day — that’s right, you just kept that jaw chewing and your body in digestive mode pretty much all day. As a matter of fact, it’s ruinous to your health and will keep your blood sugar levels perpetually up (that means your pancreas is exhausted from constantly pumping insulin — and that eventually leads to diabetes type 2, folks). IN THE KITCHEN: Which olive oil is the right one for you? Not a week goes by without someone extolling the virtues of Mediterranean cuisine and its central ingredient, olive oil. But considering that there are approximately 2,000 varieties on the market, making a choice among the rows of bottles on grocery store shelves can be daunting. Here are a few pointers about olive oil so you can get the best value for price. a fruit, of which there are more than 500 varieties around the world. Almost all the olives we eat and use are produced by six countries in the Mediterranean basin. Foodies love giving in to the temptations of fine red wine and the best dark chocolate. And more and more studies are giving them a good reason to do so, particularly because of their health benefits for the heart. Of course, the key word here is moderation, meaning a glass of red wine and just a few pieces of dark chocolate per day. If you’re susceptible to mood swings or if you have a lot of those days where you feel like curling up under a blanket and waiting for the gray clouds to clear away, you may want to consider changing up your diet a little bit. The foods we eat are responsible for our skin’s glow and our hair’s sheen, for the strength of our bones and the health of our heart. But did you know that the foods we eat also have a great impact on our mood? For years, we’ve been fed a whole string of misleading information telling us to go fat free or low fat and to avoid butter, meat and eggs. As old as that (mis)information is, it’s still upheld by the mainstream media and unfortunately, a lot of the medical community. The research however, is mighty clear: fat (good fat, the kind that comes from clean sources—more on that later) is not only helpful for satiation and appetite, it’s also your ticket to greater health. If there’s an avalanche of food spilling out of the freezer compartment of your refrigerator every time you open it, or if stuff is buried so deep in your chest freezer that you’ve stopped even trying to search for things, it’s time to get your freezer situation under control. Did you know you can make a simple sauce in the skillet? Honest, this is easy stuff! Just follow these easy steps. Let’s pretend for a moment, you’ve just sautéed some chicken and veggies. The chicken is nicely cooked, as are your veggies. Pull the chicken and veggies from the pan and place them on a warm plate and keep warm. If you have vegetarians and meat eaters cohabiting, you’re bound to have conflicts when it comes to dinner. But there are plenty of ways you can plan your meals so that everyone is happy. It just takes a bit of forethought. Which leafy green has more iron than beef and more calcium than milk? 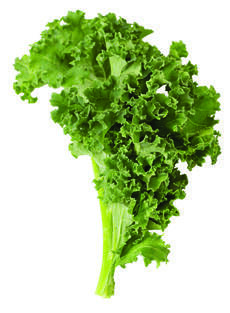 I’ve been one of kale’s biggest cheerleaders since the ’80s, back before this ultimate leafy green was a nutrition trend. I personally believe that kale is the most nutritious food you can eat. Period. There’s a reason why this queen of greens is being referred to as “the new beef,” but don’t think for one second that this is a new vegetable! I will admit that while I am now a kale aficionado, when I was in my 20s, I thought kale was only good for garnishing a plate. Boy was I wrong!